In August 2017, we hosted the fifteenth CSHL meeting on Mechanisms of Eukaryotic Transcription (MOET) and spoke with two of the meeting’s organizers: John Lis and Jane Mellor. We discussed the changes made to the meeting, and their impacts, and the organizers’ dedication to safeguarding the history of both the field and meeting. John: The bulk of the attendees enjoyed the meeting. There are some who have been at this meeting for many decades who are still warming up to the new directions, though. I think by the end of the meeting they’ll understand why things have changed a bit. Changes are useful as long as we don’t forget the history of the meeting. Jane: People are sometimes afraid of change. There are historical reasons why this meeting has been how it’s been, but it’s refreshing to make changes. I think the meeting now has a feeling of being much more inclusive. There are more talks now, which results in more people getting exposure. John: And more opportunities. A number of people have been longtime attendees at this meeting but never presented a talk. We asked a few of them to give a talk this time and they were appreciative. We’ve also taken a more egalitarian style for the presentations. Rather than having 20- and 8-minute talks, every talk is 12 minutes long followed by 3 minutes of discussion. We’re trying to just pick talks, not edit or decide who has longer or shorter time slots. Everyone responded pretty well, and the speakers condensed even very complex stories into efficient presentations. Jane: The quality of the presentations this year is actually much higher than it was when we had different talk lengths. And everybody’s gotten something from the talks: good questions, concise discussions, etc. The more established members of the community contributed older data and observations to the discussions, and that historical context is really useful for younger attendees. We have participants here with the memory of what’s happened to the field over many, many years. This is a really good aspect of this meeting that I think is valuable. John: Of course there’s been a substantial change in the science. The transcription field is such a rich playground – with lots of factors, sequences, and information – that it can be problematic for those entering the field. They have to gain a command of the past to use all the tools and techniques. It’s challenging but I think this meeting brings them up to speed. I hope the young folks appreciate the classic stuff that’s been done. And I hope the old folks begin to appreciate the fact that doing things genome-wide and making measurements massively on lots of factors is useful in the context of figuring out how genes are regulated. The genome provides us with the numbers and statistics that enable us to draw conclusions we couldn’t from looking at only one or two genes. It’s come out a couple of times here, where major conclusions were made on small percentages of genes that turned out to be outlier groups. Jane: One thing we do realize now is that a lot of genes we studied in the past were outliers. Another change worth mentioning is the evening poster sessions. I’ve always felt that the poster sessions were never long enough: We have so many brilliant posters that a 2-hour session is insufficient. 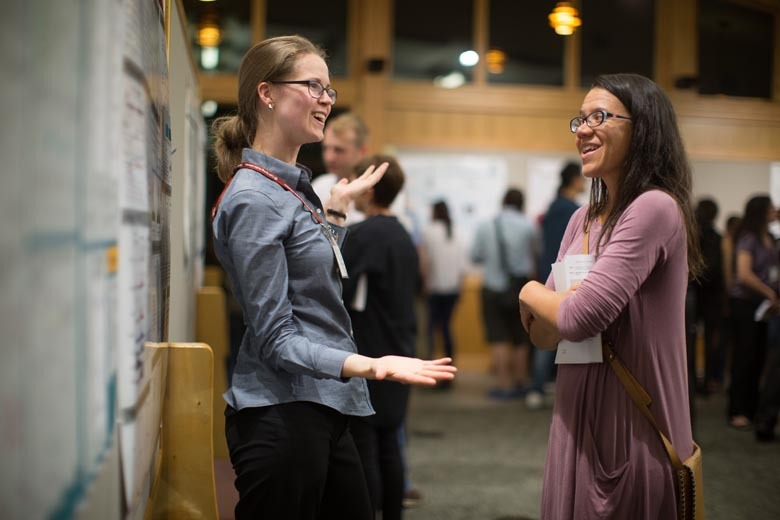 The evening poster sessions – which started at 7:30 and ended whenever everyone was ready – provided a much more relaxed atmosphere. This year, people were still at the posters at 11 PM and no one was rushing around trying to visit all of them. It’s good for the poster presenters as well because there is more opportunity for lengthier conversations. John: I think this meeting has really good representation from the field. Jane: I would say that pretty much anyone who’s anyone in the field is here: not everybody, but most people are here. Even though this year’s meeting coincided with an EMBO chromosome transcription meeting, most of the field’s influential people are here, so MOET still has the pull and the cache to make people want to come. Jane: The structural view of transcription is something that’s really come to fruition this year. According to Patrick Cramer’s talk, we are having a truly mechanistic view of the transcription process. The next big challenge is to bring in the chromosome, but what Patrick showed was just spellbinding and amazing -- model enzymes changing, what Mediator’s doing, what the rest of the PIC’s are doing, etc. Twenty years ago, we could have never predicted that we’d be in a position to do this kind of work. John: Structural studies with cryo-EM have been transformative. Another interesting and powerful addition is the genome-wide studies adopted by people in classical biochemistry who extend their analyses genome-wide. And then you add to that the fact that there’s this concept of phase separation, these droplets where things can happen in a very rapid way, so there may be some sort of compartment for these reactions. This has been coming up again and again and I’m beginning to take it seriously; it’s sort of changing my way of thinking. MOET returns to the Laboratory in 2019; and during the summer, we offer the Chromatin, Epigenetics and Gene Expression course. For an introduction into the annual course, be sure to read our Q&A with 2017 GNX Alumna Ulrike Boehm. For more conversation with other meeting organizers, check out the rest of our A Word From series.